One of the most important and often most difficult parts of a manager’s job is to be able to effectively communicate with the physicians and employees with whom they work. The manager serves physicians that are performing many roles in our organizations - doctor, owner, manager, and employee. This session will teach the best ways to prepare reports, hold formal meetings and have discussions in a variety of settings. Employees present a different set of challenges and the program discusses how to deal with problem employees and difficult situations such as conflicts and termination. Stephen A. Dickens is an attorney and Vice President of Medical Practice Services at SVMIC. In this role, he advises physicians and their staff on organizational issues including governance, operations, strategic planning, leadership, patient experience and human resources. He is a published author and frequent speaker at state and national conferences on these topics. Mr. Dickens has spent the last 26 years working with physicians in various roles including 15 years in medical practice, hospital and home care executive positions before joining SVMIC in 2008. He is a Past Chair of the Medical Group Management Association having served as the first solo chair of MGMA-ACMPE. He is a Past President of the MGMA Financial Management Society, Tennessee MGMA and Tennessee Association for Home Care. He is a Board Certified Medical Practice Executive and a Fellow in the American College of Medical Practice Executives. In addition, he has previously earned Fellowship in the American College of Healthcare Executives and certification as a Home and Hospice Care Executive by the National Association for Home Care. He is the 2015 recipient of the Martha Johnson Distinguished Service Award from the Tennessee Medical Group Management Association honoring his contributions to the organization and the medical practice profession. Take advantage of early bird rates and save $100! Register by February 15 to be entered into a drawing for a CASH PRIZE! 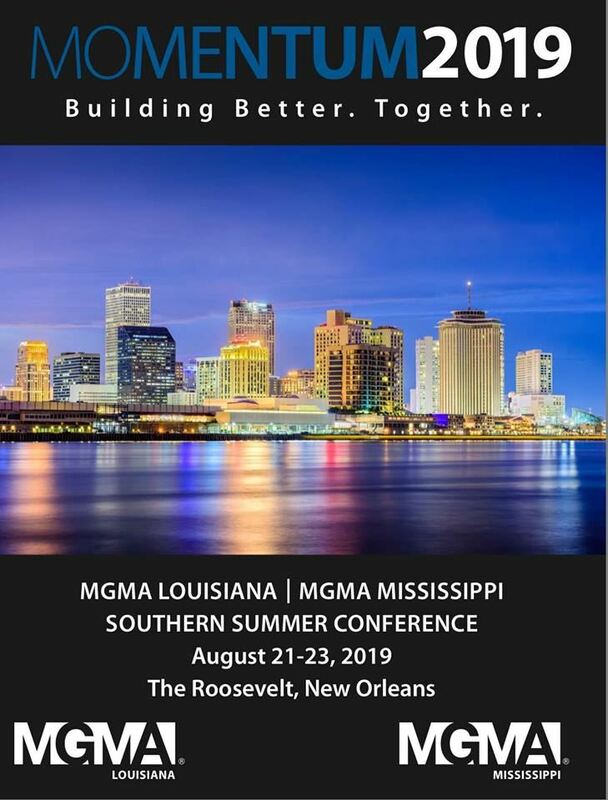 MOMENTUM 2019 is the annual collaborative event bringing healthcare professionals from Mississippi and Louisiana together. It features top notch speakers, presentations and materials along with valuable networking opportunities. We are proud to designate The Roosevelt Hotel New Orleans as our 2019 conference headquarters. This session is intended to provide a broad overview and some deeper dives into the processes involved in gathering, inventorying and analyzing your current payer agreements, initiating a renegotiation properly, modeling offers and testing payer counter offers, managing the negotiation timelines, and contract provisions, beyond the rate exhibit that are essential in renegotiating, understanding and managing your agreements.